In a medium bowl combine: flour, cocoa, baking soda, and salt. Set aside. In a mixing bowl at low speed, beat: butter, brown sugar, and white sugar, until blended. Increase speed to high: beat 5 min until it’s light and fluffy. Reduce speed to medium and add the eggs one at a time. Add the dry mixture and buttermilk alternating like so: half of the flour, all the buttermilk, and the rest of the flour. After each addition beat until just combined. Scrape the sides a few times and make sure the batter is smooth. Bake times: mini cupcakes 14 min, regular cupcakes 22 min, three 8″ round cakes 30-35 min. If doing 3 cakes, place 2 on top rack with a space between them, and place third on lower rack so they are not directly on top of each other. A toothpick inserted should come out clean. For cupcakes, cool in pan one minute before removing from pan to place on cooling rack. For round cakes, cool in pan 10 minutes before running thin knife along edge of cakes to loosen, then invert onto cooling rack. After removal from pan, cool on rack at least one hour. 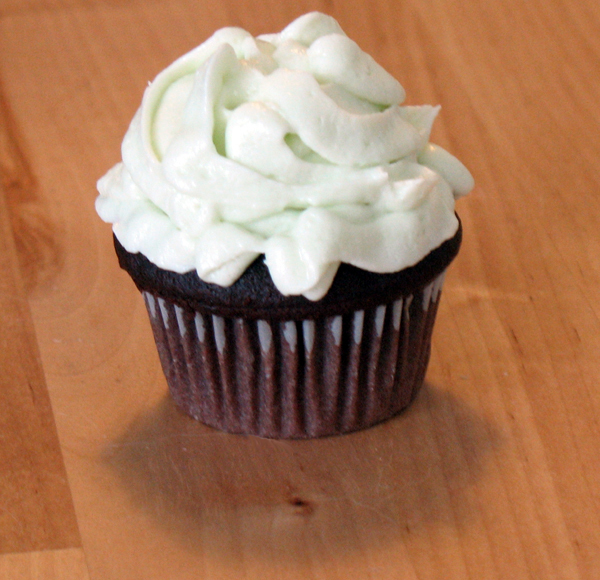 Frost with your favourite homemade icing, recommend chocolate or vanilla buttercream.